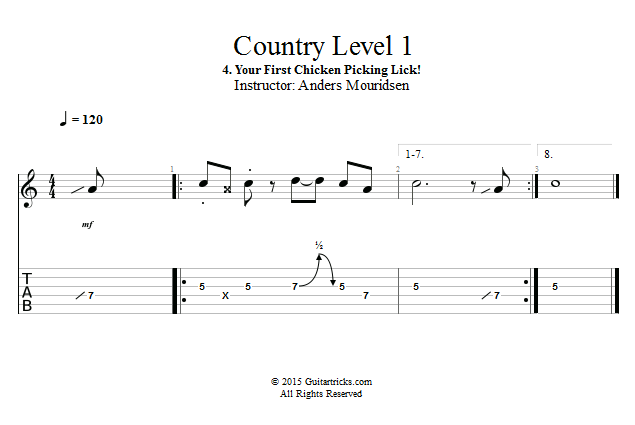 Guitar Lessons: Your First Chicken Picking Lick! Now that you're familiar with the basic technique, let's use it to come up with our first chicken picking country lick and try it out over the backing track. So for this example we're going to be in the key of C and we'll be using the notes in our C major pentatonic pattern. Remember that we'll be using our pick for the muted downstrokes and our 3rd finger for the percussive "plucking". We'll start with our 3rd finger in the 7th fret of the D-string and you can kinda slide up to that note.